Develop a plan to help your overweight horse get healthy. Thanks to overfeeding commercial feeds and rich pasture, more and more horses are becoming overweight. An overweight horse is at risk of exercise intolerance, heat intolerance, lameness such as joint, hoof or tendon issues from carrying extra weight, reproductive problems, metabolic issues and, of course, laminitis. Similar to humans, weight (fat) loss is achieved when the body expends more calories than it requires, forcing it to use stored fuel to support its demands. Therefore, decreasing calorie intake and/or increasing energy expenditure through exercise can help a horse lose weight. Decreasing calorie (energy) intake can be achieved either by restricting calories, which requires knowledge of the calories your horse needs and their requirements, or by decreasing feed intake, which is typically easiest for horse owners. Most weight loss studies have shown effective reduction in weight and condition when a horse’s feed was reduced to less than 1.5% of their body weight of hay intake (eg. for a 500kg horse, decrease feed intake to 7.5 kg per day total to start). For horses that are more resistant to weight loss, it may be recommended to decrease feed intake further, though not going below about 1.1% without direct oversight from a veterinarian. As the horse continues to lose weight, the amount fed will be adjusted. For any horse that is overweight, the easiest thing to start with is to decrease/eliminate all grain feeds, including commercial feeds, and all pasture grazing from the diet. 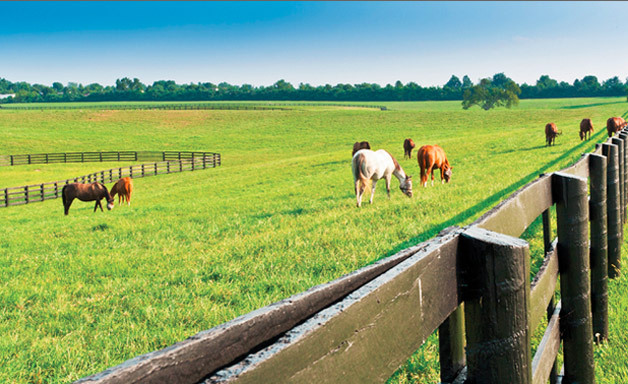 It is very difficult to control and to quantify pasture intake, so removing it from the intake equation is a big part of calorie control for horses. I recommend keeping overweight horses in a dry lot, though if facilities prevent this, a grazing muzzle can be helpful for some horses. 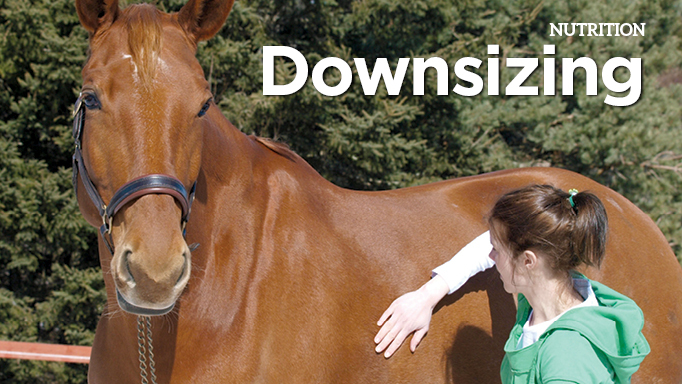 Overweight horses should only be fed measured amounts of hay to reduce their calorie intakes. Therefore, in effort to ensure nutrients other than calories are being met, a hay analysis is vital to measure nutrient content of the hay. The analysis will tell you the percentage of nutrients the hay, and how much (if any) supplementation, is needed. Because the calories of ration balancers can add up, particularly if fed at 1 pound/500 grams or more per day, it is more effective to only add in a pelleted vitamin-mineral supplement (usually at a rate of about 80 grams or less) and then soybean meal (or other protein source with >40% protein) in amounts of 100-200 grams per day, as needed to balance out requirements. For example, 7.5 kg of 10% protein hay would provide more than enough protein for a 500kg horse at maintenance or in light work. But if the hay was only 8% protein, the horse might need about 65 grams of added soybean meal to meet his protein requirement. 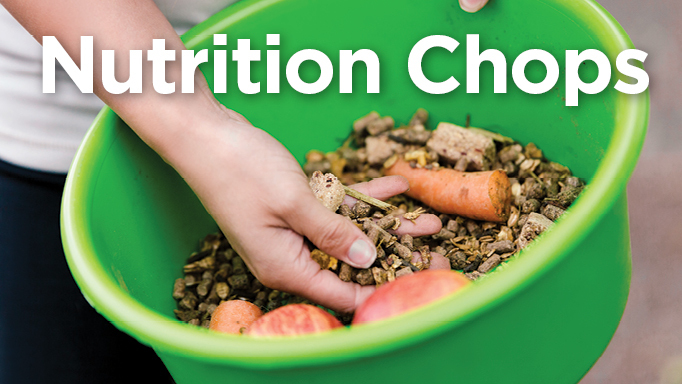 Because feed intake is limited, it is important to offer it spread out throughout the day. This can be achieved by using slow hay feeders and/or grazing muzzles for the hay. It is also possible to feed lower calorie density hay – that way the horse could be fed a little more hay, or would lose weight a little more easily. It is also recommended to provide your horse with toys or other non-sugary enrichment to help prevent boredom that might come with less food to consume. Other tricks might include placing hay in various spots around a paddock to make the horse have to walk around to get it. The other big contributor to weight loss is exercise. Research has shown that even low-intensity work (less than 30 minutes per day of walking and trotting) can be effective for weight loss, even without dietary modification. 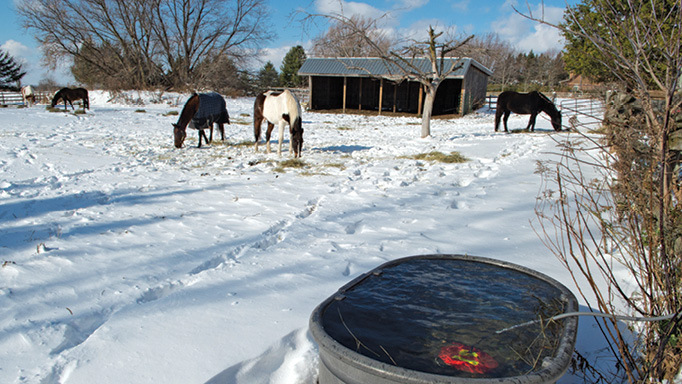 If a horse has soundness issues, light hand walking or swimming might be viable options. Exercise also promotes better glucose regulation and insulin function, counteracting metabolic issues and decreasing the laminitis risk. Of course, one of the biggest challenges to weight loss efforts is commitment. Research has shown in many species that owner compliance is the biggest indicator of weight loss in a pet. In equine research, owners of previously laminitic horses tended to have the highest compliance in their horses weight loss efforts, partly because they experienced the risks first-hand. It should be noted that just like for humans, there is no supplement that can magically make a horse lose weight. Drugs like levothyroxine can increase metabolic rate and aid in weight loss for horses with hypothyroidism, but any drug should be a last resort if diet/exercise fails. There are some risks associated with weight loss efforts. Severe calorie restriction, particularly in miniatures, ponies and donkeys can trigger hyperlipemia, which can be fatal, and why feeding less than 1.1% of body weight isn’t recommended unless under veterinary care). Research has also observed horses in weight loss studies to consume their bedding, particularly straw, which, though low in calories, can still add up. And, if they’re eating wood shavings, for example, they may experience digestive issues. In general, it is the same story for humans and horses – restrict calorie intake and increase the exercise! It’s not magic. 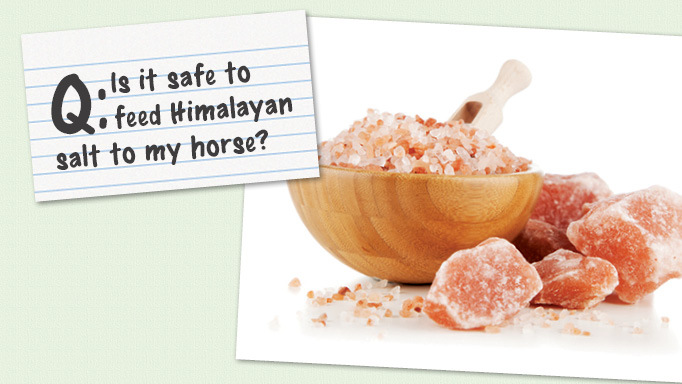 Because it is unprocessed, Himalayan salt contains numerous other minerals, but are they helpful?